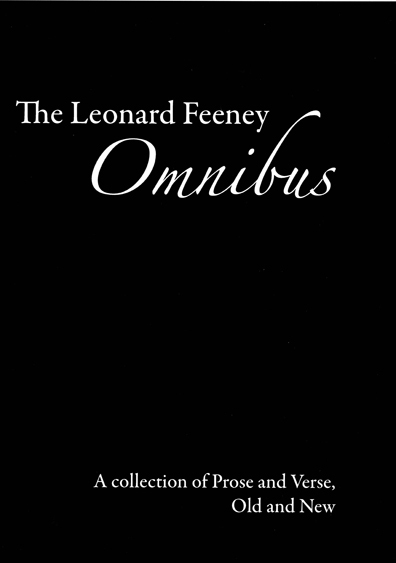 This collection of poems and other literary works of Father Feeney is not a complete collection, but a large one nonetheless. It includes almost all of four of his best books: Survival Till Seventeen, Fish on Friday, In Towns and Little Towns, and You’d Better Come Quietly, as well as some of his other works. You will rarely encounter another modern Catholic poet and writer with such depth of faith and dramatic power with words as Father Leonard Feeney. Frank Sheed, of Sheed & Ward, his original publisher and a well-known Catholic writer himself, once labeled him “America’s Chesterton”. Coming from a Catholic Englishman, that is a grand compliment indeed for an American Irishman! “Father Feeney has… revealed the playfulness of his wit, the keenness of his observing eyes, the tenderness of his Irish heart . . . THE AMERICAN ECCLESIASTICAL REVIEW, Feb, 1944. 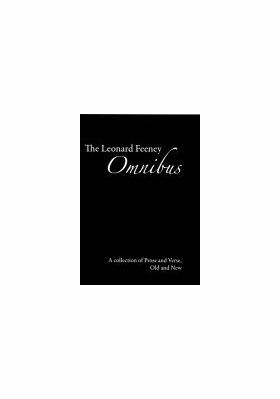 Most of the material in this Omnibus has been printed before. Yet the publishers have done the cause of American letters a considerable service in bringing out this collection. Certainly the years to come will see more extensive editions of Father Feeney’s works. We are fortunate in having this much now. This Omnibus, small though it is, is far more effective than little books and scattered articles in bringing us to appreciate the foremost man of letters in Catholic America. His trained and gifted mind has caught what is best in our own life scene. The Omnibus shows us Catholic loyalty in a barber shop, the theological virtues on the Boston and Albany, apologetics on the New York, New Haven and Hartford, and God’s charity in Lynn and Paris. The things he saw are the things we all might have seen, and which we know better because he has seen them. Father Feeney as an author we reverence and acclaim. However we are considerably less enthusiastic about his prowess as an editor. It is difficult in the extreme to pardon a man who left “The Brown Derby” out of a Leonard Feeney Omnibus. My publishers have been very kind in letting me make my own choices. A number of things have been omitted, over protest of my friends. But a poet—if such I be—must ultimately be his own critic, his own chooser. It is one of the few freedoms left a man in this merciless age. I am not, as one critic has kindly suggested, “a poet of many personalities.” I am a poet of one personality who has had many moods. I realize I could have made a much greater reputation for myself if I had written everything in one groove. But in this matter I took a cue from God the Father—who is the poet, the maker, in God—and who could have made a much greater reputation for Himself if He had made the lion and omitted the mosquito. Other than this, I offer no apologies. L. F. August 6th, 1943. Of what the people sang or said. To show him any sort of kindness. I in my clothes, he in his traces. And went on purpose to a fair. Saw Mary give her Child a kiss. And simply let it go at that.